Like most desirable cities, McKinney has created and preserved its unique history and culture. Its architecture and public spaces stand unchanged from their original forms. Neighborhoods established in the beginning of the 20th Century remain enact. This phenomenon sets McKinney apart from other North Texas towns and provides a rare sense of place that people want to experience. The City of McKinney recognizes that this sense of place is the city’s “golden goose.” Without the architecture character that defines McKinney, this town would be just another Dallas suburb. It is out of this desire to keep McKinney historical that a program was created that rewards home-owners who preserve the historic nature of their homes. The reward is a seven year exemption from City ad valorem taxes. This means an eligible home with an appraised value of $300,000 could expect to save about $12,000 over the period. This program not only maintains McKinney as a commercially vibrant city for tourist, it also preserves what we like about living here – its feel. Is My Home Eligible for Tax Exemption? First, it must be a minimum of 50 years of age, that is, built in or before 1964. Second, it must be within the designated boundary. The HNIZ boundary extend beyond the normal McKinney Historic District. This means a house can be eligible even if it is not on a street designated with the brown “McKinney 1848 Historic” street sign. Thirdly, a house’s exterior must be, for the most part, unaltered from the original, or if it has been, the alteration must be at least 50 years old. The City has a specific application process for awarding the HNIZ tax exemption. Doing the research to obtain your HNIZ tax exemption can be fun if you like detective work and have the time to pour over historical documents at the library and the Collin County tax office. If you do, please download your application from the City website and start your adventure. On the other hand, I can do this work for you and provide you an in depth report about your home’s history and the people who lived int. If you contact me, I can provide you a cost estimate for researching and applying for your exemption. Though costs vary depending on the scope of the research, the money you save will be more than what my research costs. You’ll come out ahead the first year your exemption takes effect. I will respond quickly to set up a free appointment with you to talk about your project. Click link to contact me. In order to have the exemption applied to the current-year property tax bill, you must submit your application by February 1. There are several administrative steps that the City must take in order to process these applications. You will want to submit your application as early as possible. It's not just McKinney architecture that is memorable. The people who lived and visited McKinney in the past are perhaps more striking than the architecture. Past residences of McKinney include pioneers, Civil War veterans, outlaws, bankers, cotton traders, mule traders, a Texas governor, and a U.S. Senator. In 1923, one of the more interesting residents was J.J. Raney, an oil man, who embezzled $234 from his employer, the Texhoma Oil and Gas Company. He eluded arrest and was thought to have drowned in an East Texas lake but showed up in McKinney months later to visit relatives where he was finally taken into custody. Among other illustrative personalities to spend time in McKinney were Jesse and Frank James as well as Bonnie and Clyde Barrow. 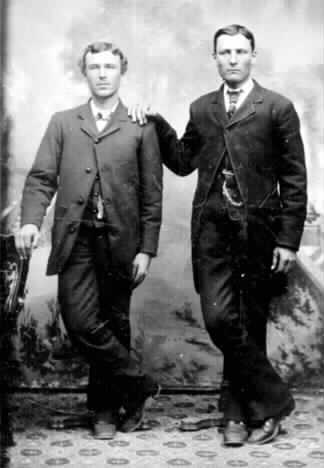 In the first half of the 20th century there were McKinney residents related to these notorious outlaws and hosted them in their homes. In the early years of McKinney, everyone was connected by a web of business and family relations. It is nearly certain that at least one of the owners of your home was either famous or infamous. It is fun to find out.